Sometime you come across something, be it a tiny bit of quote, be it a book or someone saying something that you overheard and you exactly know this is what you needed the most at this moment. so when i stumbled onto Alan Watt's talk on works as play, i was delighted to hear what he was talking about. At this point really really i need to work on my work. In modern lifestyle as we are bombarded with so many works, responsibilities, this to do, that to do .. often time we feel dispirited by the burden of work. sad part is, we have to live with it as our journey through life goes on. Following are 3 parts video via youtube where Alan Watts a world known personality talks about Work as Play. I enjoyed his personality and the way he expressed what he wanted to express. Alan Wilson Watts (January 6, 1915 - November 16, 1973) was a philosopher, writer, speaker, and expert in comparative religion. He was best known as an interpreter and popularizer of Asian philosophies for a Western audience. 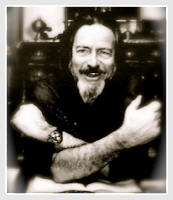 Note: the sanskrit term satsang means meeting with truth, it also means company of the wise.
. for more talks of Alan Watts visit Seeker After Truth.
. a conversation with mySelf is another interesting talk to hear.